It seems that the older I get, the more stuff I have going on. Funny, I thought that getting older meant things would calm down, but that has yet to be the case! On that note, I quickly discovered that there was a great need for new organization tools that I could use to keep everything in order. Sure, I have a planner that I use to track meetings and assignments, but I wanted something that would cover more than just the basics. That’s why I decided to start creating my own planner printables (available in The Study Sesh shop). I’ve been working hard to consistently add new products to the shop based on areas in life that we could all use a little more organization. The hourly planner printable featured above is a simple design for those of you who just need to divide your day into smaller increments. I created this one with students in mind, but this could easily be used for anyone who has a tight schedule to keep (I’m talking to you entrepreneurs – I know you’re hustling hard out there to gain success)! I also recognized a need for shopping list and menu planner printables for those individuals who like to have meals planned in advance. By the way, this was not the original design I had envisioned at all. 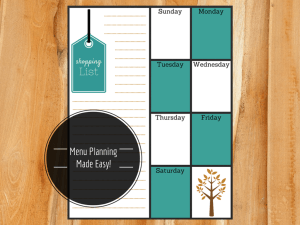 Originally, I didn’t even plan on having the days included, but I quickly realized that it made sense to have the menu planner right next to the shopping list. I think one of the biggest benefits of having shopping list and meal planner printables is that you can post them on the fridge for everyone to see. That’s right – No more children nagging you about what’s for dinner on Wednesday after book club. You now have the power to tell them that they can reference the fridge if they would like to see what’s on the menu. I’m no stranger to running a chaotic life. Sometimes it feels like you literally have 30 hours of work to fit into a 8 hour work day (which actually ends up being 10 hours because a meeting ran over, a client went into crisis, or you absolutely HAD to get your final product turned in by the midnight deadline). 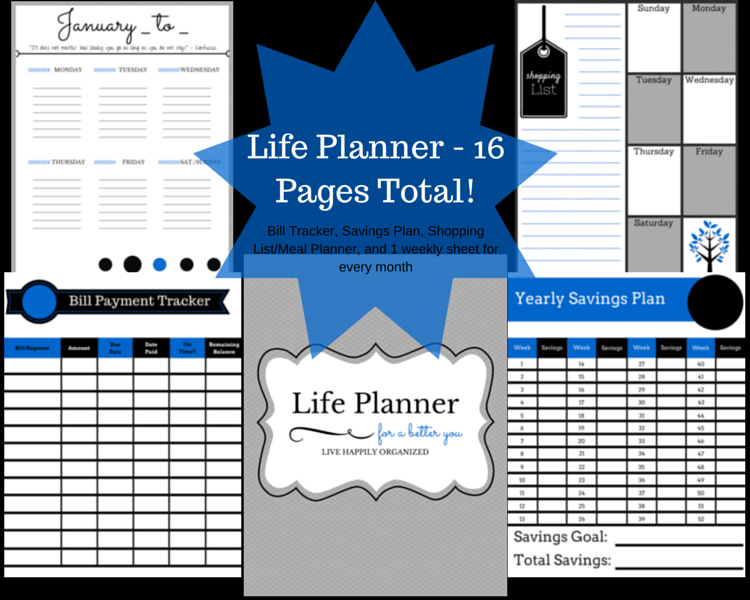 That’s why I decided it was time to create a life planner printable so that you could get all of the necessities in one place. I chose purposely to leave off the year or specific dates in this planner printable because I wanted people to be able to use it whenever they wanted. The great thing about purchasing one of these is that you can print as many as you want! That’s right – I haven’t put any limits on them. 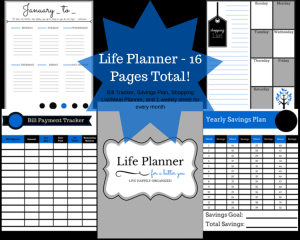 I did my best to make sure that these planner printables work for you so that you can get your life organized without spending an arm and a leg. And Don’t Forget the Budgeting Sheets! Let’s just be honest – Keeping track of your finances is SUPER important! There are tons of budgeting tools and sheets out there, but I wanted to create a simple set that was easy for anyone to use. 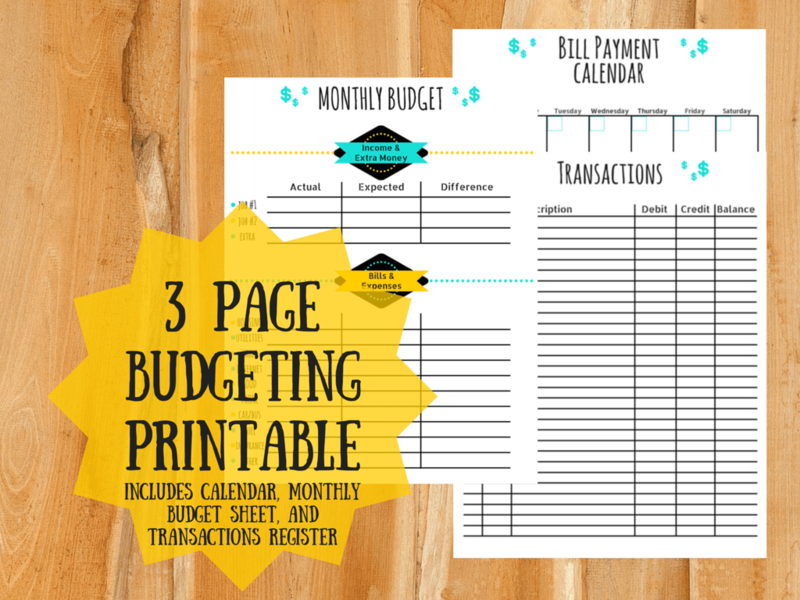 The 3 page budgeting printable set featured above contains a budget sheet, transaction tracker, and calender. 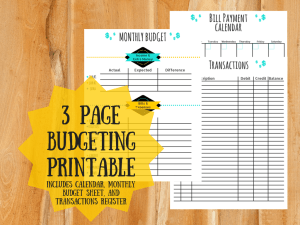 Since I enjoy designing planner printables and understand that money can get tight, I make free printables every now and then to help out. Like I said, the last thing I want to do is break your bank. I just know how much I spent on my planner this year and I’m honestly appalled because I could have easily bought a printable version for so much cheaper! Alright, enough about getting organized – I’d like to hear from you! What are some of your favorite designs and colors for planners, shopping lists, or budgeting sheets? I completely agree! It’s amazing how much money you can save by creating your own AND you can customize them to fit your personal and household needs! I LOVE these!! Thank you! This is exactly what I need to jump start some new organization in my life! I am a planner junkie so thanks for sharing~!! I love this idea! I can never find a planner with what I need. Its always missing something or has too many things I don’t need. These are beautiful! I pretty much need all of these! I’m so disorganized, it’s one of those things that I feel motivated to do once a year, and then it slowly tapers off. I’m an organizer by heart but even I get to a point where I need to separate my tasks into different sheets so that everything stays straight! One day, I’ll have my whole life organized in a binder with printables. For now, I’ll settle for a generic planner from Amazon and an Excel budget. If anything could encourage me to get that binder going, though, it would be your fun printables! Great printable!!! I can’t live without my planner and writing things down! What a great idea! I never thought of using printables but I seriously feel like you just convinced me! 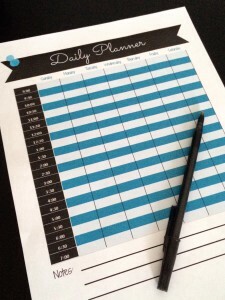 I need something to organize my blog schedule, social obligations, kid activities, husband’s schedule & menu planning. This seems perfect! I love this im always looking for a new planner!! Great printables! I literally use my planner for everything! I would be lost without mine most days! this is exactly what I’ve been looking for! & so so cute! I will definitely pin this!! First, I LOVE the colors. I had on my to-do list to night to find a planner, so thank you! I”m trying to get my life organized. These are some great printables! these are great! i am notorious for buying planners and forgetting to use them. and then rebuying another with the intention of “getting organized”. having a downloadable piece is helpful for people like me who continually forget a few days. thanks for sharing. Ah I just love planner printables! I have a planner that use for most things but I’m always wishing I had a printable page to add in for menus and whatnot. Thanks for sharing! They are so fun and super helpful! I love all the different designs that people have made. I will definitely be checking out the budgeting sheets! I have got to get better about keeping track of my expenses. I think that’s something that we all work on throughout life, no matter how good we may be with our finances! I love all of these. I have to say the menu plan is my favorite. I could really use that. Thanks for these printables! Anything to help me to stay organized is good to me. 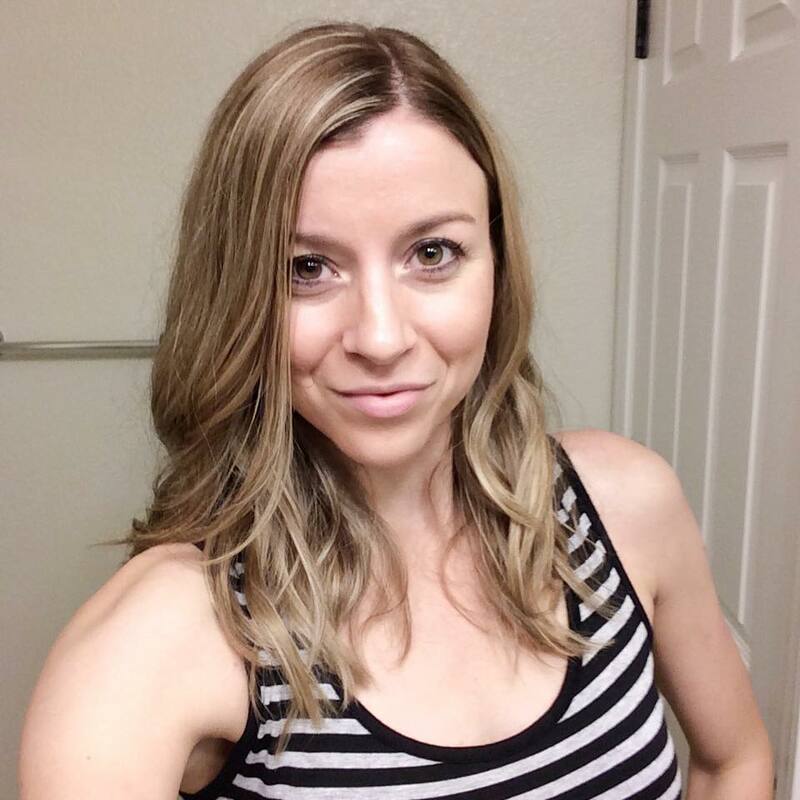 I find it to be challenging more so now that I am a working mom! I super love organization!! I love that you did this post about printables because I use printables all the time, and they are wonderful! Thank you again and GREAT post!